How Far Can Your HDMI Cable Go? Posted on June 6, 2016 by T.D. The Premium HDMI Cable Certification Program was conceived as a way to identify cables that have been tested for specific performance levels. This leaves us wondering if any High Speed HDMI cable can pass 4K content? The answer is this: as long as the cable is truly high-speed HDMI, it will be able to pass 4K content. All high-speed HDMI cables now have the bandwidth needed to carry 4K content. Although many people believe that it’s necessary to pay $50 or more for HDMI cables, this isn’t actually the case. Often, stores are simply taking advantage of the fact that consumers do not know the ins and outs of high-speed HDMI cables. How Long for HDMI Cables? How long can your HDMI cable be? 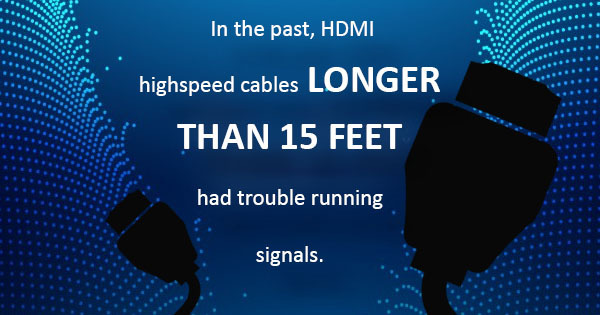 In the past, HDMI high-speed cables longer than 15 feet had trouble running signals. Today, cables are more reliable over longer distances than this. There are a few standard HD resolutions (720p, 1080i). HDMI is an uncompressed signal, so the bitrate is the same as the information you’ll see in the final picture (standard definition is 480p). For consumers planning on running their HDMI cables behind walls and ceilings, it makes sense to pay for a better HDMI cable. Length doesn’t affect either video or audio signals — length only makes a difference in going long distances. HDMI cables 100 feet or longer for example, should be specifically designed for that distance. You may have heard of something called category 5 cables or “Cat5e cables” for short. This is a twisted type of cable, and it’s used to carry signals for telephone, video and Ethernet. If you purchase Cat5e cables made of high quality materials, they should easily last you at least five to 10 years, if not longer. Can you use Cat5 cables for HDMI? Although people sometimes use Cat5e as an extension for HDMI cable, your best bet for longevity is to buy the correct cables the first time around. You would likely need two Cat5e cables to handle the entire HDMI signal requirement.